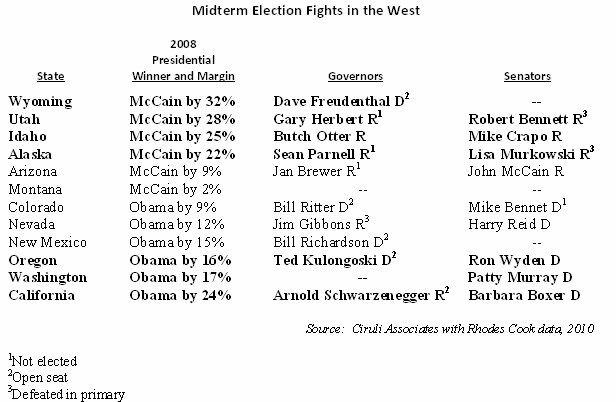 The West will be a major battleground for the two parties in the 2010 midterm elections. After years of Republican dominance in many states, Democrats made inroads since the start of the new century. This year, Democrats are playing defense, even in California. But, the Republican Party is involved in a major upheaval as several incumbents have lost primaries. 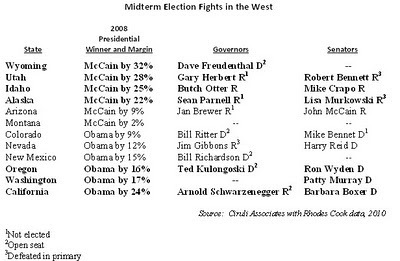 The following table displays twelve western states and the major midterm elections in each. The chart is divided by a northern tier that tends to be the most Republican, the southern tier the most competitive and the western tier the most Democratic. • Wyoming – Matt Mead (R) is frontrunner to be governor. • Utah – Tea Party helped dump long-term Republican Senator Robert Bennett. Republicans dominate. • Idaho – Democratic congressman Walt Minnick fighting for re-election. Republicans dominate. • Alaska – In an upset, Lisa Murkowski loses her primary to Tea Party candidate who Sarah Palin endorsed, Joe Miller. Republicans dominate. • Arizona – Jan Brewer (R) has strengthened her re-election with immigration legislation. John McCain’s primary win over anti-illegal immigration opponent shows limits of the issue. Three Democratic congressional seats rated toss-ups. • Colorado – John Hickenlooper (D) is frontrunner for governor due to Republican scandals and infighting. Senate race should be close, expensive and negative. Plus one endangered Democratic Congresswoman, Betsy Markey. • Nevada – Nevada governor likely Republican. Senate race close with Majority Leader Harry Reid burdened by Washington reputation, but Tea Party opponent making mistakes. • New Mexico – Governor’s race is a toss-up. Parties’ nominated two women. A Democratic congressional seat in play. • Oregon – Oregon’s governor race leans Democratic, but rated competitive. The senate incumbent appears safe. • Washington – Senate incumbent Patty Murray in tough re-election battle. • California – California Democrats’ hold on statewide offices is endangered. Both governor and senate races are rated toss-ups. More than 150 Ciruli family members gathered at Pueblo’s beautiful Rosemount Museum on August 7 to celebrate 120 years of family history in America. 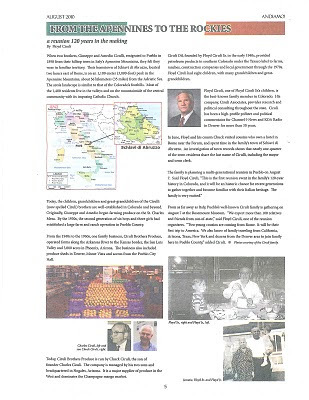 A reunion website with the family history is here (http://www.cirulifamily.com/) and an article on the family in Andiamo! 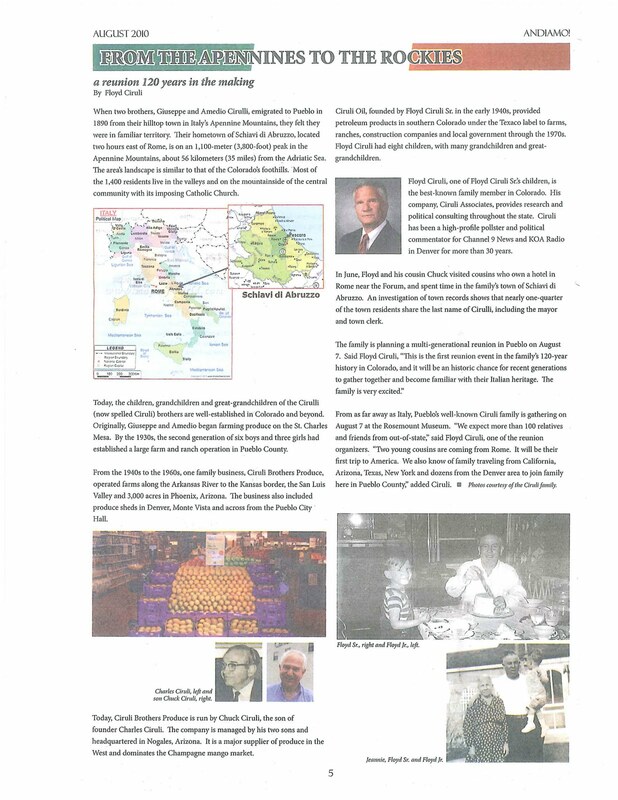 newspaper is posted here: From the Apennines to the Rockies. Liberals and much of the Washington establishment are flummoxed by the rapid decline of the President’s and Democratic Party’s political clout over the last 20 months. The plunge from a 53 percent sweep in the 2008 presidential race, accompanied by massive margins in the U.S. House and Senate, to a presidential approval in the low 40-percent level (down from 65% shortly after the Inauguration) and a 20 percent approval of Congress, has now led to a substantial Republican advantage in the generic ballot test. Theories as to the cause of the collapse range from blaming the media (especially radio and cable talk shows), to Obama’s alleged “coldness,” to his administration’s failure to communicate its successes. John Podesta, one of the more insightful members of the D.C. liberal establishment, offers what the New York Times titled the “Paradox of a Legislative President.” Podesta claims the President’s and Democrats’ problems result from placing the emphasis on staffing, agenda and communication on legislation. The administration, therefore, is seen as involved in partisan strategies consuming immense amounts of political capital and time, while problems, such as the economy and unemployment, linger and appear neglected. The first confirmation of the electorate’s “buyer’s remorse” came in the November 2009 governors’ elections in New Jersey and Virginia. After the disaster of 1994, Bill Clinton moved strongly to the right to save his presidency (causing some of the lingering hostility among liberals that benefited Obama in his primary with Hillary Clinton). It remains to be seen if Obama will adjust course. Meanwhile, the prevalent liberal think tank doesn’t see substance as a problem, only mistaken strategy. The Republican establishment lost control of the 2010 nomination process and two insurgents won the U.S. Senate and Colorado gubernatorial nominations. Ken Buck and Dan Maes both overcame high odds and won party primaries on August 10. Jane Norton, the establishment’s candidate for senate, and Scott McInnis, the endorsed and well-funded candidate for governor, were beaten in hard fought primaries. Although Maes maintained a 1,000-vote lead most of Election Night, his victory was not declared until after the 9KUSA 10:00 pm news. Buck’s senate win had become irreversible in the count shortly after 9:30 pm. 9KUSA called all the key races first and surprisingly early. Maes won by only 6,000 votes and carried most of the Front Range and Eastern Slope. Scott McInnis carried his old 3rd Congressional District, but was hurt by his plagiarism scandal in the Denver metro area. He lost every county. 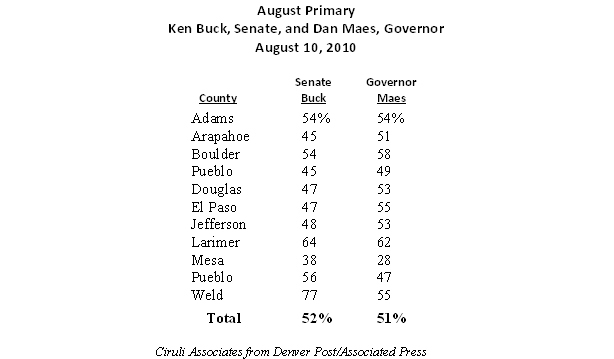 Maes was clearly helped by Buck’s sweep of voters in Weld and Larimer counties. Also, his insurgent conservative credibility was a draw in El Paso, which gave him his statewide margin of 6,000 votes. Norton did well with establishment Republicans in the Denver metro area, carrying Arapahoe, Denver, Douglas and Jefferson counties. 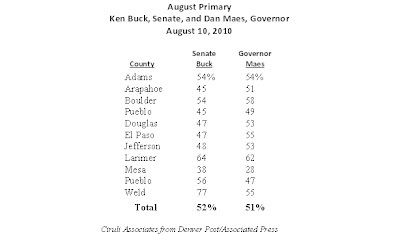 Buck, who won by a 13,000-vote margin, carried most non-Front Range counties and had huge wins in Larimer and Weld counties (Buck took 51 out of the state’s 64 counties). The western U.S. has some of the most interesting midterm elections in the country. In December 2010, the Pacific Chapter of the American Association of Public Opinion Research holds an annual conference where the nation’s best pollsters gather to dissect the November election. This year, along with panels on Colorado, Nevada, California and other competitive elections, the Tea Party movement, immigration and gay rights will be discussed. Click here for the latest PAPOR newsletter. The Obama administration, concerned that November is heading for a major political blowout, has invested millions in re-applying and tuning up the 2008 voter ID and turnout machine. The operation has $50 million and Obama’s top campaign operator, David Plouffe, managing it. The whipping Michael Bennet gave Andrew Romanoff’s campaign in the August 2010 primary was the machine’s first successful outing. An expected close race became a 28,000-vote, 8 percentage point blow-out that Channel 9 KUSA was able to call by 8:30 pm. The DNC voting machine helped beat Romanoff in nearly all large counties and crushed him in many small counties where mail-in ballot chasing techniques can be most economically and effectively applied. 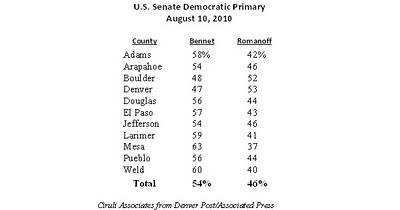 Bennet beat Romanoff by 60 percent or more in Alamosa, Archuleta, Conejos, Costilla, Delta, Garfield, Las Plata, Montezuma, Phillips, Rio Grande, Sedgwick and Washington counties. Of course, Bennet’s spending and efforts were substantial, but the campaign was in panic the last two weeks until the DNC resources begun to bear fruit with high rates of turnout of new primary voters, often in Colorado’s isolated small communities. U.S. Senator Mark Udall’s help was also evident in many of the mountain areas where his environmental credentials are strong. 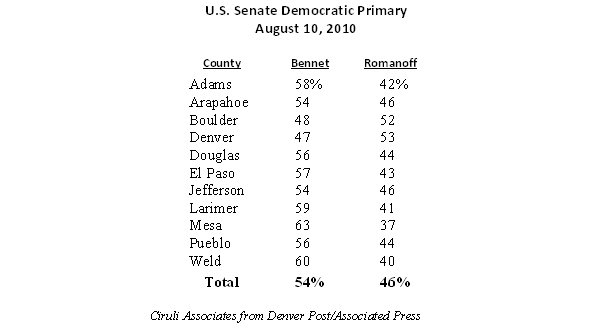 Bennet won, for example, San Miguel (Telluride) – 65%, Pitkin (Aspen) – 74% and Eagle (Vail) – 63%. Expect to see the DNC machine this fall. Republicans may have enthusiasm and issues, but they still do not appear to have caught up with the Obama campaign’s technical sophistication. John Hickenlooper starts his media campaign in a shower. Strange, but not surprising. In 2003 when Hickenlooper ran his first campaign ads for mayor, he took on downtown parking meters in a humorous ad. In his assist to the 2005 Referendum C campaign, he jumped out of an airplane. Hickenlooper goes for the smile. As I commented on KOA August 19, the ad is well-designed and the message is basically defensive. He’s trying to inoculate himself from the inevitable onslaught of negative ads that will attack him as a liberal, big-spending Democrat. So, his first ad attacks negative ads, which most voters say they don’t like. The ad voiceover claims Colorado needs a governor who “brings people together to create jobs and cut government spending” – essentially Republican themes. The ad’s most effective aspect, however, is its non-partisan, good government tone. It is vintage Hickenlooper, the funny, quirky non-politician who just wants to work together for the common good – nice start. To see press release and Hickenlooper's new ad, click here. A Saturday article in the New York Times began a network and cable news rush to Colorado on Monday before the August 10 primary. It reflected the most national commentary I’ve participated in since starting at Channel 9 and the old Rocky Mountain News in the mid-1980s. Fortunately, my interview with the New York Times took place before I had a beer at Gus’ Tavern in Pueblo, not after 150 members of the Ciruli family began a weekend reunion. The highlight of the interviews was a half-hour with CNN’s John King on Monday night. The panel had Ed Rendell, the governor of Pennsylvania, a very sharp and pragmatic Democratic advocate. My CBS clip referenced Andrew Romanoff selling his house as a sign of determination, producing a lot of offers for futons and air mattresses for Andrew. PBS is still the standard for long-piece political journalism, and my interview was used to open the show, and in a longer piece on the Colorado primary – a real treat. In the Denver Post’s Sunday article, I predicted the camera crews will be back in late October. Colorado has all the conditions to remain a political battleground. Front page of August 15 Denver Post perspective section makes the case Colorado remains a battleground, at least in the Senate race, due to the close balance between the parties and the strength of the major election themes – dislike of Washington DC, new and extreme forces influencing the Republican Party, and intervention of the new Democratic get-out-the-vote model.